Can be thrown by swinging overhead or popping like a whip. 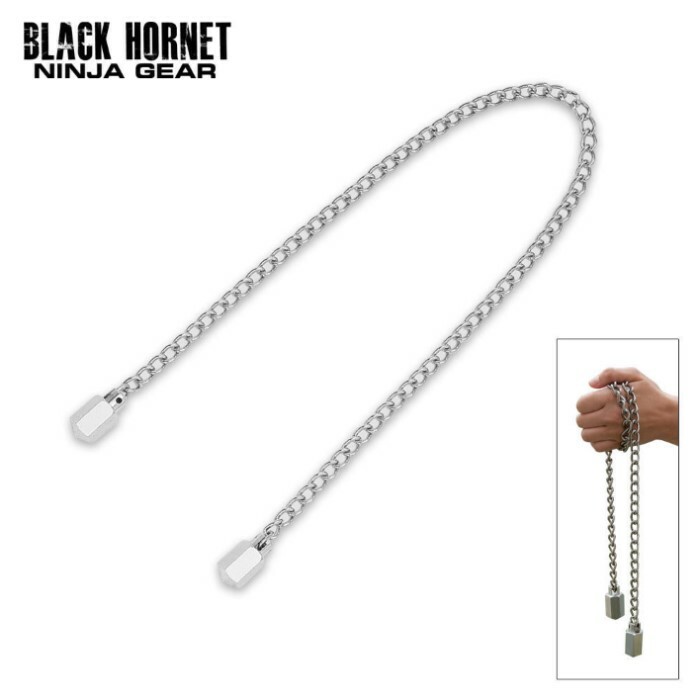 With a little practice, this chain can bring down a target at 75 ft. 32.5" of steel chain with weighted ends. The hex weights on this thing are heavier than any manriki I've owned. Bash anyone real good. 5stars, will buy again. Well I already love the weapon itself because of the history behind it, so my review may be blurred a little. But it seems pretty good for the price you pay. The weight is pretty good, it does flake a little though. The chrome flakes off and leaves metal flakes, all over. Also, edges of the weighted ends are rough and will scratch up your own hand(needs to be sanded down). I already had the black chain and it's much better. no wonder this one costs less. I got my chain today and I find it to be in good quality. The weight doesn't seem too light or too heavy and at the ends the point it rounded a bit which can be pretty good if you do intend to hit something with it. Pretty darn awesome. The silver does come off when your swinging it alot but it still serves its purpose perfectly. Wow! This thing is SOLID. I don't understand why people are complaining about the length. The chain (plus the weights) are 32.5 inches long. What did you expect? A 6 foot chain? This is the traditional length, and it's perfect. It's ideal for swinging around to gain quick momentum. Any longer and it would be impractical and cumbersome. The weights on the end could do some SERIOUS damage, if used properly. (Just make sure you don't knock yourself out!) True Swords has never let me down! WHat can i say i love it wraps nicely around my arm and is easly accessable if needed .Most ppl think its a metal bracelet when i have it on my arm so no one realizes it can come out and crack their skull if they tryd to attack me .the chain itself is way stronger than it looks (i even tried to break it to seehow muck it could take and barley got a scratch on the ends __)the weights can do some damage when u swing them around just make sure u practice some before u use in a real fight as the weaights can hurt u if ur not carfull(dazed me a bit when i was swinging around lazily and hit my head never wanna feel a force swing after that)All in all recomend for display or for self defence works great both ways. It's much smaller than anticipated, but it's still a pretty good buy for $10.